Being an eminent organization in the industry, we are involved in manufacturing a premium quality range of Acrylic Bead Pendant Set. 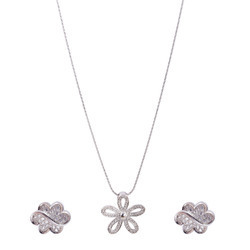 An enchanting colour of pendent set grab the attention of everyone. It is made up american diamond and black onyx with rhodium polish without chain . This pendent set can be worn in all occasion , party, wedding and at work place also. 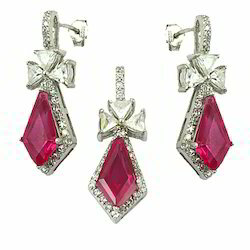 Care: Avoid exposing the earring to water, chemicals, or harsh treatments. quality of the product is very good for more informatin whatsapp on 9620143437. We offer high quality range of Designer Gold Pendant. This range is manufactured using high quality material with advanced technology. Our range is available in various heart touching colorful designer patterns. We offer our range at market leading prices. - Weight : 10000 gms. Being one of the trusted organizations in the market, we are indulged in providing a wide range of Stylish Diamond Pendant Set.